One of the most challenging aspects of gaming is finding the time to play. Some families play games daily, other families only play on Thanksgiving night. You know your family best. Do what works for you. Here are some tips and tricks for making the space for play in your life! Games provide an opportunity for stealth learning. Gameschooling does not look anything like the school of your past, but that does not mean it is any less educational. We all know that play is important, so separate school and education in your mind and give yourself permission to play! Is your child struggling this week and crying over his math book? If you know what you have, you can ditch the books and play a fantastic math game. It counts, I promise. 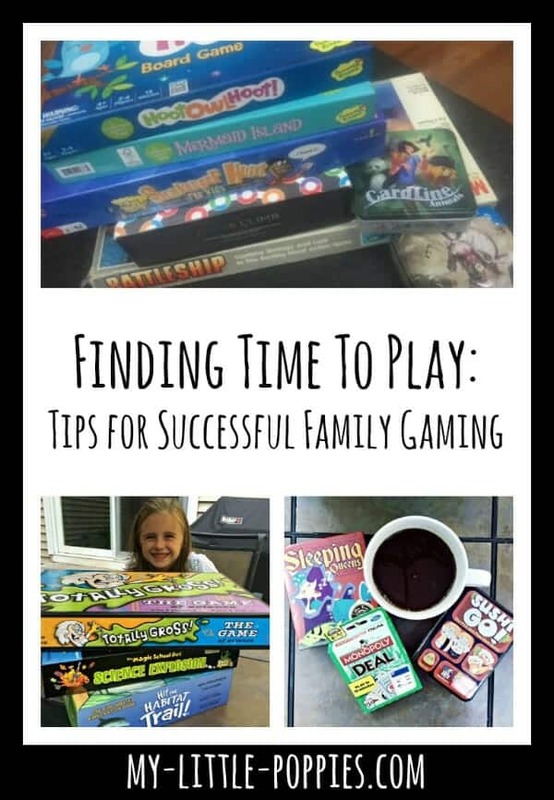 This helps if you know what you have, so be sure to organize that game closet! Routines and habits take time. If you want to be a family of gamers, pick a date and a time that generally works for everyone and schedule it. It might be Saturday night or Friday mornings over lunch… do what works! What game does everyone love? Be sure to have it on hand for impromptu playing! On Sunday afternoon, I’ll often pull out a few games I’d like to play during the week. Maybe we’ve been light on science and I want to squeeze in a gameschooling science lesson, or maybe it’s a game we haven’t played in a while. I leave the stack out in the open as a visual reminder. You never know when you’ll find yourself waiting… either in a waiting room or at a restaurant. Tuck Bananagrams in your purse or glove box. You’ll be glad you did! Now, it’s your turn. Tell me: How are you finding time to play? What tips or tricks would you add? Share here!